The Mettler Toledo ML104T analytical balance has a capacity of 120 grams and a readability of 0.1 milligrams with a pan size of 3.5" (90mm) diameter. 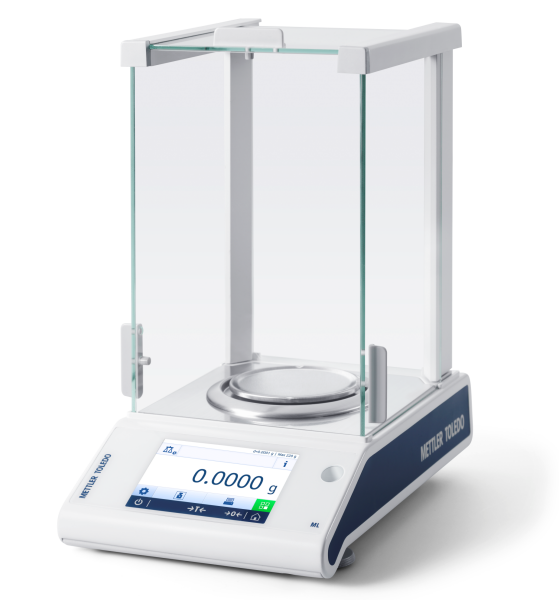 The ML-T analytical balances from Mettler Toledo are the most complete entry level analytical balances on the market. With large and vibrant color touchscreen displays, that can be operated with gloves on, these balances are incredibly easy to read and operate. The MonoBloc weighing cell is fast and durable and comes with Mettler Toledo's FACT (fully automatic calibration and temperature) internal adjustment functionality. Three interfaces (USB, USB (host) and RS-232) come standard (Bluetooth is optional) and, when connected to a computer, can transmit data directly to open Windows programs like Excel, without additional software. ML-T balances are compact and can be run on batteries or the included AC adapter. The ingenious balance leveling function guides the user through leveling the balance with easy to follow on-screen instructions. The MinWeigh functionality allows operaters to set minimum weight tolerances for dosing and indicates limits by flashing green or red on the screen. ML-T are constructed with robust metal bottom housings and easy to clean ABS top housings. The draftshield is easy to take apart for cleaning and all parts are washing machine safe.